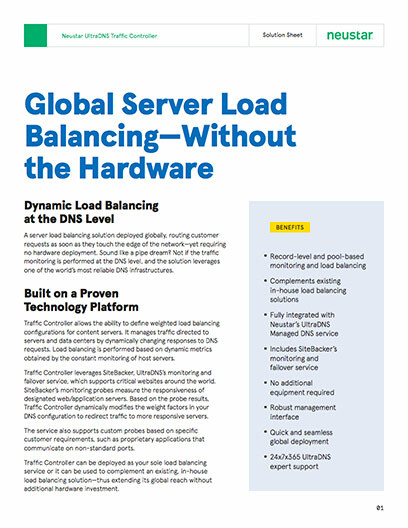 A server load balancing solution deployed globally, routing customer requests as soon as they touch the edge of the network—yet requiring no hardware deployment. Sound like a pipe dream? Not if the traffic monitoring is performed at the DNS level, and the solution leverages one of the world’s most reliable DNS infrastructures. Traffic Controller allows the ability to define weighted load balancing configurations for content servers. It manages traffic directed to servers and data centers by dynamically changing responses to DNS requests. Load balancing is performed based on dynamic metrics obtained by the constant monitoring of host servers. Traffic Controller leverages SiteBacker, UltraDNS’s monitoring and failover service, which supports critical websites around the world. SiteBacker’s monitoring probes measure the responsiveness of designated web/application servers. Based on the probe results, Traffic Controller dynamically modifies the weight factors in your DNS configuration to redirect traffic to more responsive servers. The service also supports custom probes based on specific customer requirements, such as proprietary applications that communicate on non-standard ports. Traffic Controller can be deployed as your sole load balancing service or it can be used to complement an existing, in-house load balancing solution—thus extending its global reach without additional hardware investment. The Traffic Controller service supports weighted load balancing (WLB) as well as the traditional “round robin” approach. With WLB, weights are applied to authoritative queries on a percentage basis. Next you assign a “weight” to each host, choosing an even integer from 2 to 100. These weights allocate the proportion of traffic each host receives, based on the ratio of any one weight to the sum of all the weights. In the example below, Host1 would be served for DNS resolution twice as often as Host2 or Host3. Host1 would get 50% of traffic, while Host2 and Host3 would each get 25% of traffic. Warning — No configuration changes are made. Critical — Weight is dynamically reduced by 50% to reduce traffic to that server. Failure — The specific record is no longer served. This change is included in the notification. So if Host1 reaches the critical threshold, the original weight of 4 is reduced to 2. Host1 then only gets one-third of traffic.